You see.... Since I last posted, I lost my big brother. There was nothing wrong with him and he was at one of the happiest points he had ever been in his life. He was simply in the wrong place at the wrong time, when the ground literally crumbled beneath his feet on a cliff edge and he fell to his death. Suddenly, my own existence and how I live my life has been brought into sharp focus. Amidst the twisted pain that is grief, is the realisation that life is too short to hang around procrastinating and deferring hopes and dreams. Once I am 'through' this, I intend to spend more time with those that are important to me and to step up a gear and start living..... really living! 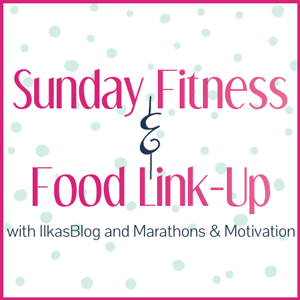 When you experience loss and your eating dips, every meal becomes important, both for nutritional content and for keeping up routine. It is so important to make every calorie count. When I get stressed about normal day-to-day events, I tend to reach for the sweet stuff. 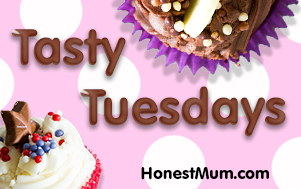 At the moment, I seem to be craving nourishing, savoury, slightly salty dishes. I love this bowl of protein-filled goodness. Unique in its oriental simplicity, I was first introduced to it many years ago when I went to visit a friend in Japan. I was taken to meet some of her good Japanese friends, who shared their hospitality with the same dish, but using an uncut block of tofu. It has remained with me as one of those memorable travel dishes, which has somehow become merged into my UK foodie repertoire. 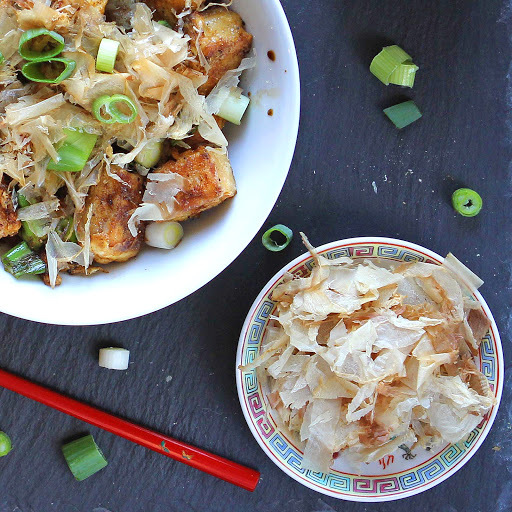 The tofu gets coated in cornflour and then fried so that it forms a crisp coating around the soft white interior. I was so taken with the combination of textures, that when I re-made it here, the tofu got cut into cubes, so that I got more of the crispy magic. 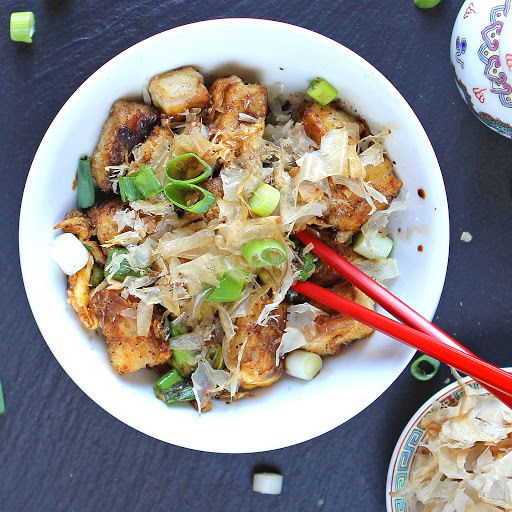 The fusion of the tofu with egg, spring onion and soy sauce (make sure you use gluten free Shoyu if you need to) which is then broken up, leaves you with a sort of deconstructed Japanese omelette. It's amazing (even if I am not selling it very well)..... really! And if you have never tried Bonito flakes, but you love the flavour of smoky fish, then I urge you to source some. Although they are not essential to the dish (if you are veggie, you will still enjoy the rest), they do add an extra, very Japanese dimension. Bonito flakes are fine flakes of dried shaved tuna. They contribute a savoury, slightly fishy, smokiness which is pretty unique. 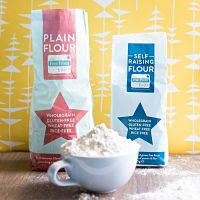 When you sprinkle them on the hot, moist base, they seem to move and bend with the heat, a little like those bright orange fortune fish that came out of Christmas crackers when we were kids and curled with the warmth of your palms. Bewitching and delicious! ....... any perfect for when life is the pits! Alphabakes with The More Than Occasional Baker (and Caroline Makes) - May's letter is F. Slightly tenuous link I know.... but I am going for the Fish Flakes that are Bonito, as well as the fact that the tofu is Fried. 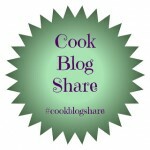 Cook Blog Share, this month with Hijacked by Twins. 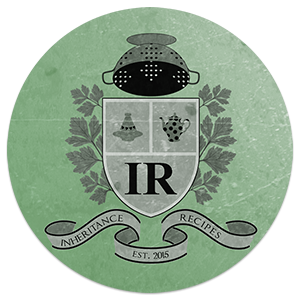 Inheritance Recipes with Coffee & Vanilla (and Pebble Soup). This is one of my foodie travel memories that I so wish to pass on to Miss GF, who (phew!) really enjoyed the mingling of flavours in this dish. 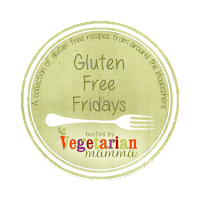 Credit Crunch Munch, this month with Utterly Scrummy (& Fuss Free Flavours & Fab Food 4 All). 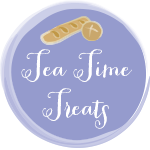 The Tea Time Treats linky, with Janie over at The Hedge Combers (and Lavender & Lovage), who are asking for colourful entries. I love the subtle colour contrasts of this dish.... they are so appealing! 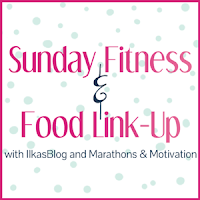 Sunday Fitness & Food link up with Ilkas Blog (and Marathons & Motivation). 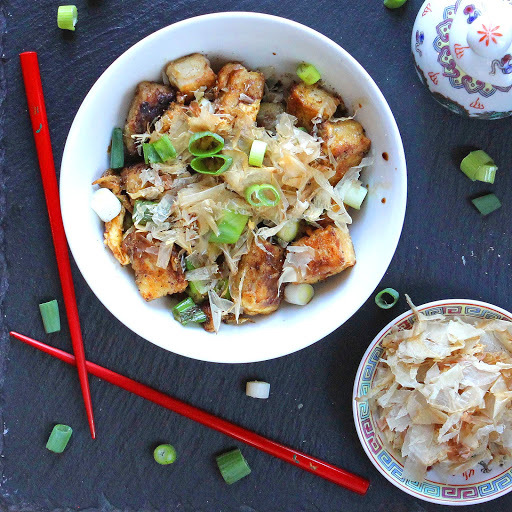 Coat the tofu cubes in cornflour, making sure they are well covered and set aside, separated from each other. Heat about 2 tablespoons oil in a wok or frying pan until very hot and then add the coated tofu to the pan, frying and turning until the coating is crisp and golden on all sides. Add the beaten egg to the pan and allow to cook and firm up. 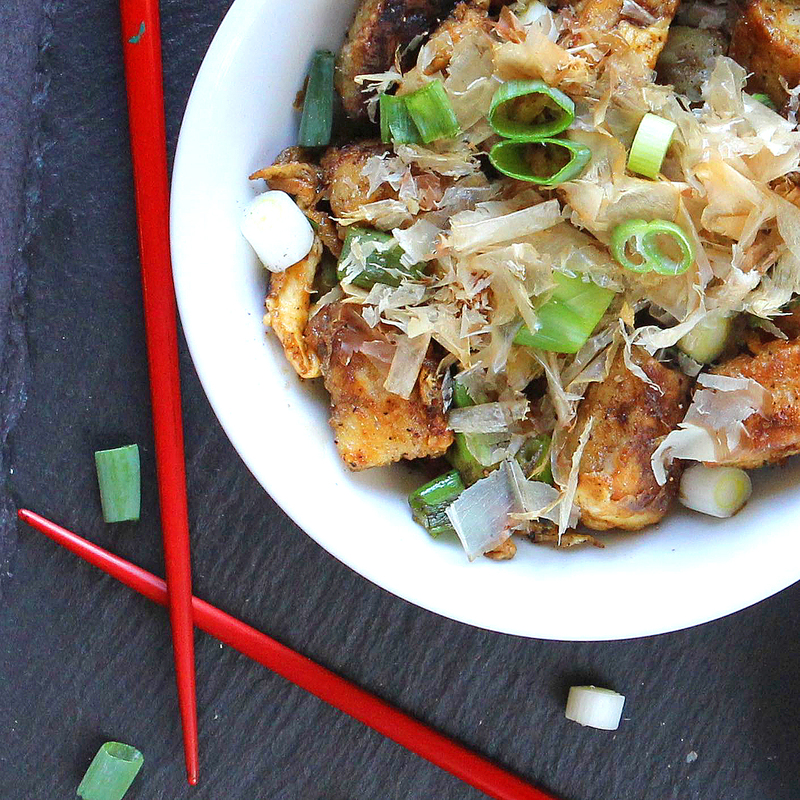 As the egg solidifies, break it up a little with a spoon or spatula so that you have pieces of egg and tofu. 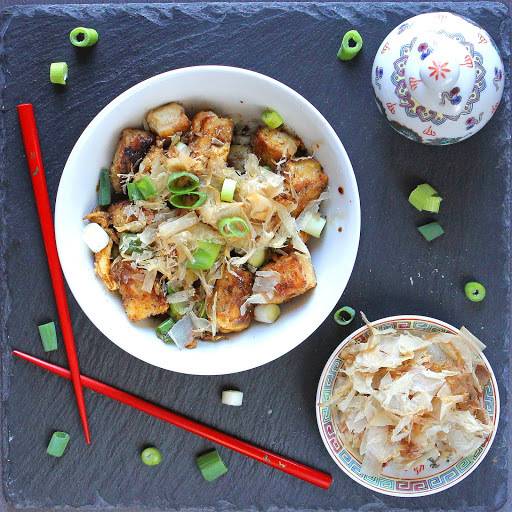 Add half the onions and a good splash of GF soy sauce and mix through, allowing the onions to soften slightly as they mix with the egg and tofu and the flavours mingle. Turn off the heat and transfer to a serving bowl. Sprinkle with a good handful of Bonito flakes (if using) and the rest of the spring onions and serve. Kate- I am so very sorry to hear about your brother. I am really at a loss for words after reading about the tragedy. I am extending heartfelt condolences to you & your family. My thoughts are with you at this time. I'm so very sorry to hear about the loss of your brother Kate, how very horrible for you and the rest of the family. I can quite see why the blog may not be at the top of the list of your priorities right now, but I'm glad to see you are eating good nutritious food. Take care and hope to hear from you anon. Thank you Choclette. Some days I feel like writing a few words and other days, I just can't be bothered to even turn on the computer. But I am certainly trying to eat sensibly..... I even bought a Nutribullet! Thank you DC for your kind words and thoughts. It's amazing how many ways shock and grief can affect the body. I would never have thought that the taste buds would be in the list! But it makes sense with the overall experience of desensitisation! I have good and bad days at the moment and can flip from feeling positive to distressed in a matter of moments. 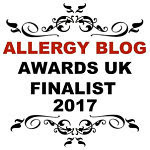 I am trying to focus on good nutrition and plenty of rest alongside a healthy dose of distraction in amongst the tears! So sorry to hear of the sudden death of your brother. I am pleased to hear you are able to travel to the US to where he lived as from our recent experience of traveling to Scotland after the death of my father in law, it really helps to go there when someone dies far from us as it is so easy to feel they are still there. I hope your travels bring you some comfort and closure. And I will look forward to when you post but I can understand it is not your priority right now. Take care and warm wishes to you and your family. Thanks Solange. 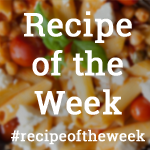 Sometimes a recipe just stays with you and you want to pass it on! Dear Kate I so much feel for you. I am really really sorry you have lost your brother in such a tragic way. Life can take us by surprise and we have to find a way to cope. You are right at taking time off to heal and in order to be able to come to terms with what happened. Thanks Ros. It has been a tough few weeks. The food in Japan is so different from anywhere else and always seems much 'fresher' in flavours. If you do try this dish, let me know how you find it. 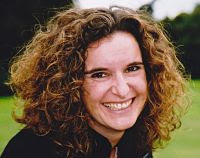 I am so sorry to hear of your loss Kate, it is a cliche but time is a healer and you will be able to look back and enjoy memories without the over riding grief. Lovely dish here for Credit Crunch Munch - I love bonito flakes and the way they gently dance.